June 5, 2016 By This post may contain affiliate links. 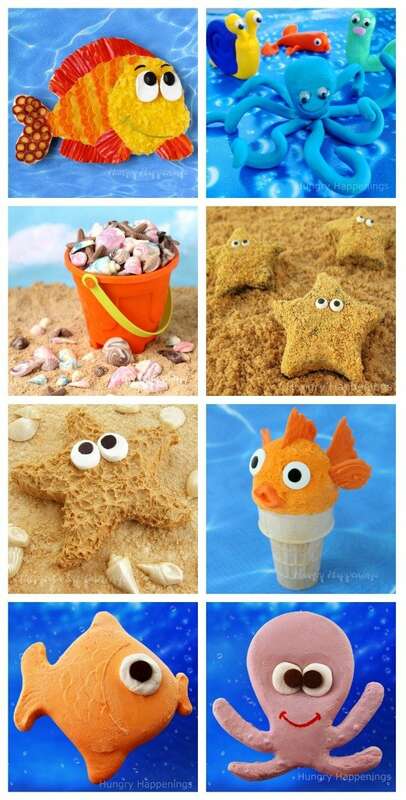 Make a splash with your kids by serving them fun Finding Dory Treats. 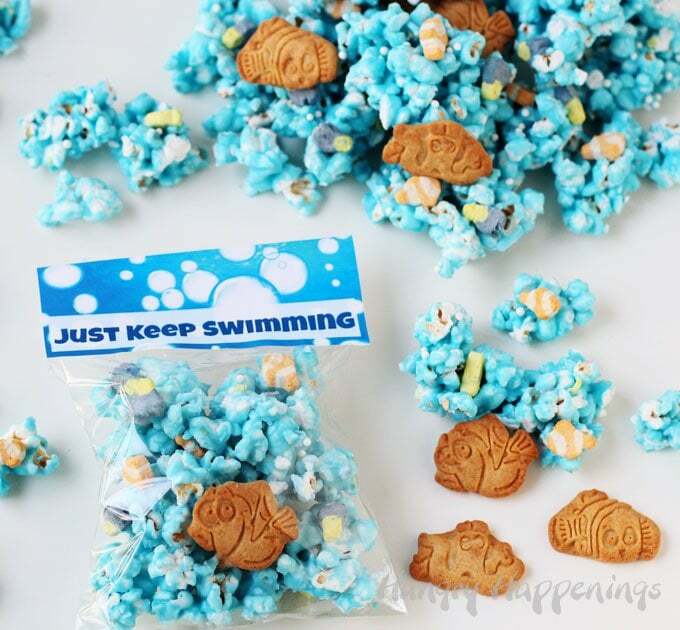 This ocean blue candy coated Just Keep Swimming Popcorn is speckled with Finding Dory marshmallows and cookies and is easy to make and fun to share. The new Finding Dory movie premieres soon and the kid in me couldn’t be more excited to see the adventures that Dory, Nemo, Marlin, and their friends take as the forgetful fish tries goes searching for her family. Disney has always done a great job creating humorous situations for their animated characters, but it is the actor or comedian who really brings the characters to life. Ellen DeGeneres, as Dory, couldn’t be funnier. I can totally relate to Dory. Her foggy brain is just like mine. The first time the cute blue fish came onto the screen during Finding Nemo, and we all laughed at her forgetfulness, my husband turned to me and smiled a big cheeky grin. He has to put up with my brain farts, those moments when I can’t remember conversations we had the day before, activities we participated in last week, or the name of a character in a movie we saw an hour ago. Usually he is patient with me, but other times he just wants to swim away. I don’t blame him. It’s a good thing that my creative mind is as sharp as ever. I think it’s because that part of my brain never stops working. I may not remember what I did last Tuesday, but I do remember all the treats I made for the beach themed graduation party that we had earlier this summer including some Under the Sea Popcorn. 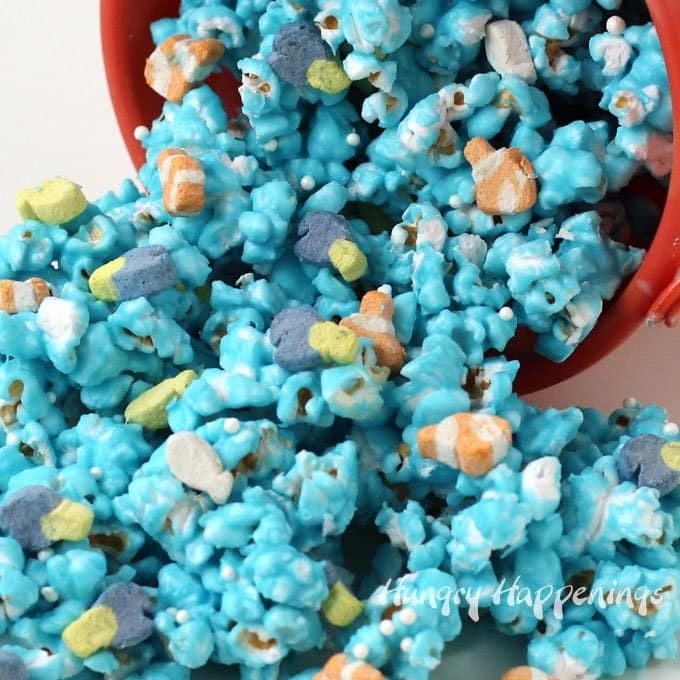 The royal blue candy coated popcorn was speckled with fish shaped cookies and tiny fish shaped marshmallows. 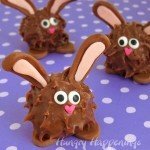 This treat looked perfect on the dessert table and tasted great. 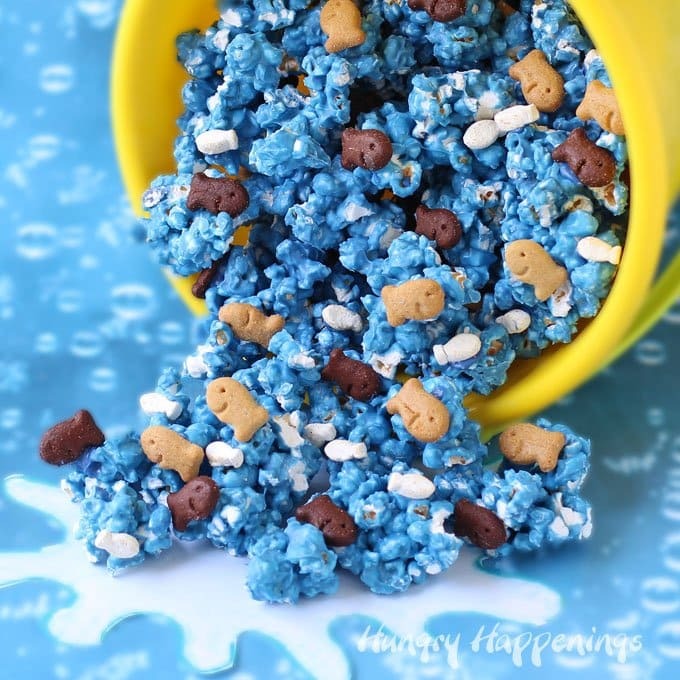 The tiny chocolate and graham cracker goldfish along with the marshmallows added a nice punch of flavor to the white chocolate popcorn and the brown, tan, and white colors were a nice contrast against the royal blue popcorn. A week after the party, I was grocery shopping and they were stocking a shelf filled with boxes of Finding Dory cereal. The cereal has tiny little Dory and Nemo (or Marlin) marshmallows. I couldn’t resist buying a box to make another batch of popcorn with this colorful fish. Before I got it made, I went shopping at another store and spotted some Finding Dory Graham Snacks. 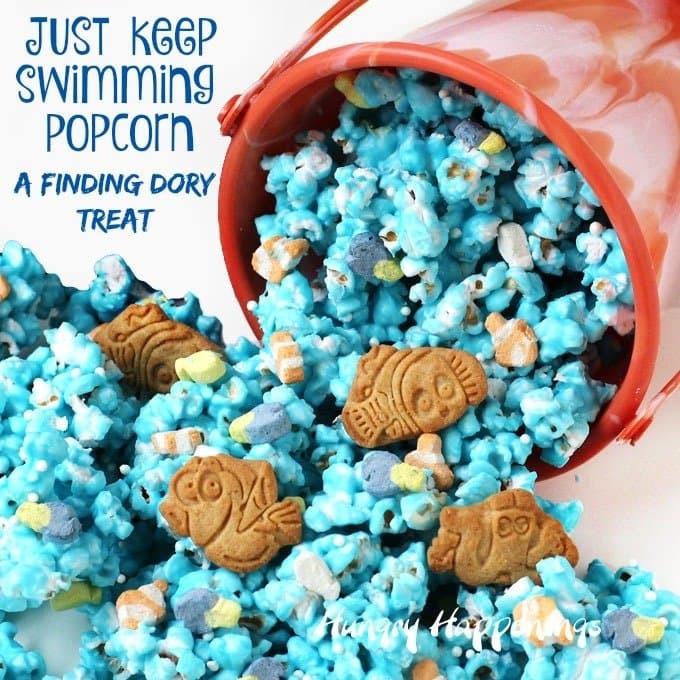 The small Dory, Nemo, and Hank (the octopus) cookies would be a perfect addition to my Just Keep Swimming Popcorn. 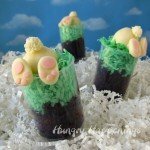 I finally stopped shopping and got busy in the kitchen making this fun Finding Dory treat. 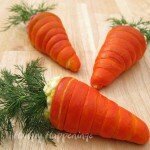 It is so easy to make. You just have to spend some time picking the marshmallows out of the cereal. The cereal is pretty good on it’s own, but the pieces are not fish shaped. 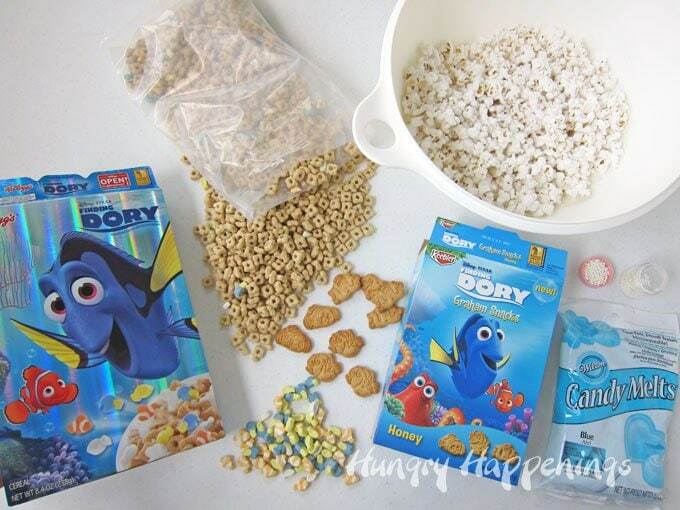 If you take them out of the Finding Dory cereal box, and pour them into a cereal bowl, no one would ever know you picked the marshmallows out of the cereal. The marshmallows look so much cuter in the popcorn, especially when they are packed up in clear bags with a printable label. The bags I used were 4 1/2 inches wide, so my labels are wide enough to fit over the opening of those bags. You may have to re-size the printable labels to fit your bags if you use a different size. 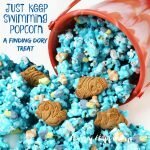 Click here for the just keep swimming printable labels. Print out a page, then cut them so you can fold the label over the top of the bag. Or, you can just pile the popcorn into a beach pail to serve it at a Finding Dory party. 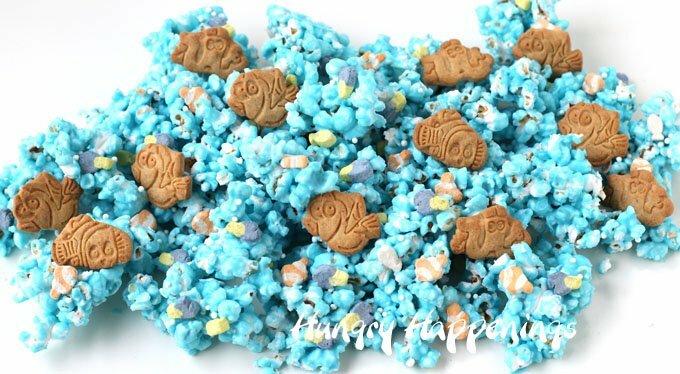 Ocean blue colored white chocolate popcorn speckled with Finding Dory and Nemo marshmallows and cookies. 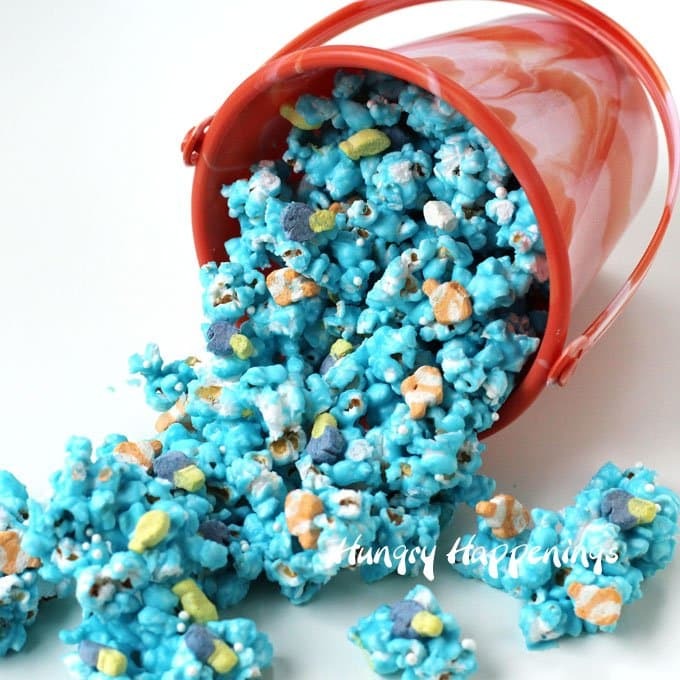 This popcorn is perfect for your kids birthday parties or any special event! Heat for 30 second burst of high power, stirring after each, until melted. Pour candy melts over the popcorn. 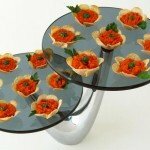 Pour out onto a parchment paper lined baking sheets and spread into an even layer. Immediately press Finding Dory and Nemo marshmallows all over the popcorn. Sprinkle on white sugar pearls. If desired, press some of the cookies onto the popcorn. Refrigerate for 8-10 minutes until the candy coating n the popcorn hardens. 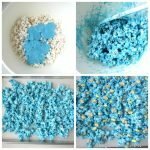 Do not mix the marshmallows in with the popcorn and coat them in the blue candy. If you do that your marshmallows will be blue. They wont look like Dory and Nemo. 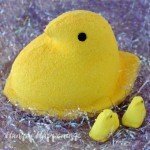 To keep the Just Keep Swimming Popcorn fresh for up to several weeks, seal it in a metal tin. It will stay fresh for a week if stored in a plastic airtight container. Use some candy melts to attach the cookies to the popcorn, if you don’t want them to move around your bag. 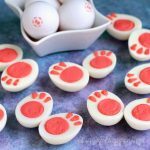 I have a few more Finding Dory Treats to create and share with you, so be sure to stop back in the next few weeks to check them out. I’m so excited about some adorable cupcakes I am working on and know you will love them. Love all your ideas! Hope all is well. Enjoy your Monday! Thanks so much, Jill. Your party looks like it was a lot of fun. 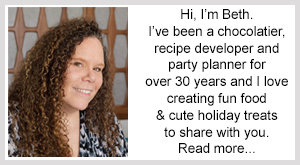 If you are heading back to Bloggy Con, be sure to look me up. I’ll be there!